The second article is Education Week series, The Future of School Reform, was written by Robert B. Schwartz, Ben Levin, and Adam Gamoran. Their article, Learning from Abroad, focuses on what the education system in the United States would look like if we followed the lead of other high-performing school systems around the world, such as Singapore, Finland, Japan, and Ontario. The authors give a brief history of the standards-based reform movement that started with the Kentucky Supreme Court finding the entire state education system unconstitutional. As a result, Kentucky developed a plan, Kentucky Education Reform Act, that was built on rigorous academic standards, state-wide assessments, and accountability measures tied to results. After the 1990 KERA reform movement, many states followed suit. Clearly, the standards-based reform movement in the United States has not resulted in great improvement in student achievement. 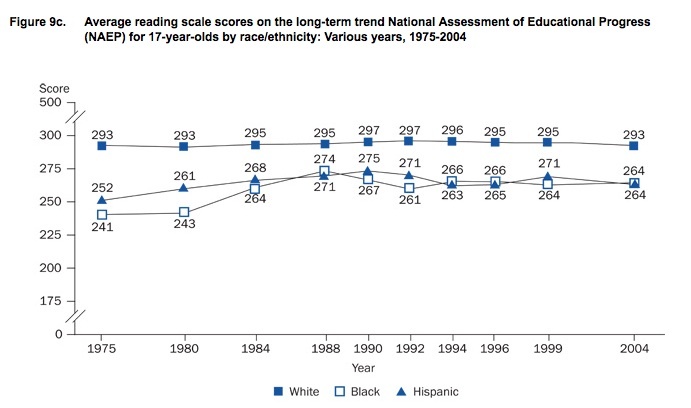 Look at the two figures below which show the long-term trends in National Asssessment for Educational Progress (NAEP) scores for 17 year old students in the United States. The progress in test scores over the past 30 years has been negligible given the vast number of resources we have spent on educational reform in the United States. These figures represent only some of the data that could be used to show that educational reform in the United States has been ineffective. In 1980, the United States spent on average about $5,600 per pupil in public elementary and secondary schools (National Center for Education Statistics). By 2006, the average per pupil expenditure increased to $10,000 per pupil, and increase of about 80%. 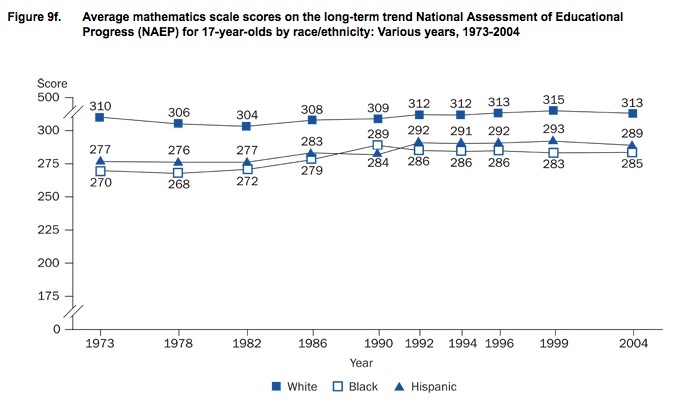 During that same period of time, NAEP test scores from 1980 to 2006 remained essentially flat. While test scores should not be the only measure of student success in school or a school’s success in educating students, it is one measure that would suggest we did not reap the benefit of a huge increase in expenditures in our educational system. The authors suggest that educational reform in United States should look for guidance from consistently high-performing school systems across the globe. They propose twelve indicators that should be used in redesigning our educational system. Focus on recruiting, preparing, and supporting high-quality teachers, because it is the relationship between the student and the teacher that can have the largest impact on student achievement. Focus on developing high-quality leadership that can lead our schools and school districts across the country. Leadership needs to focus on supporting teachers in the classroom. Focus on improving instructional infrastructures that allow teachers and principals to do their work effectively. Focus on developing a national curriculum that is streamlined and tightly organized around essential learnings. A curriculum that effectively guides teachers, but gives them flexibility to be creative with their instruction. Assessments tied to the national curriculum and special attention paid to developing students higher-order thinking skills. Will our Common Core Standards meet these expectations? Focus on investing in prevention and early intervention rather than remediation. Focus on mobilizing support systems for students and families so that NO CHILD IS LEFT BEHIND. Focus on responding to under-performing schools with early intervention and support. Ontario’s success with this should be researched and emulated. Focus on aligning all levels of education–school, district, regional, and national levels. Focus on providing a balance between adhering to national standards, but allowing for sufficient autonomy to leverage the creative talents of teachers and administrators in schools. Focus on developing more trust between schools and society. Move away from blaming teachers for the lack of success. Develop a more positive relationship between parents, teachers, schools, and administration. “Focus on improvement not blame. To accomplish educational reform based on these twelve indicators would require serious collaboration at the local, state, and national level with teachers intimately involved in the reform efforts. Right now our system is very hierarchical with most educational reform emanates from our policy makers, higher-education folks, and upper-level administrators in schools and districts. Teachers are generally not in the room impacting these conversations. Making this happen in the fractious environments that now characterize education politics in the United States will not be easy, but it is essential. Linda Darling-Hammond, Webinar sponsored by Edutopia, Lessons from Abroad: International Standards and Assessments, November 17, 2009.